This is an open invitation to everyone regardless of prior singing experience. We especially welcome shower singers! Young people also welcome. You will learn three songs, in a fast paced but supportive environment, led by Nikki Berry and her team. Even if you can't make the concert, you are still welcome to come to the workshop. This is part of a fund-raising event to keep the volunteer office open in Christchurch, so we are inviting donations, and suggesting $20.00, but if you can pay more, that's awesome, and if your voice is the only contribution you can afford, you are still most welcome! 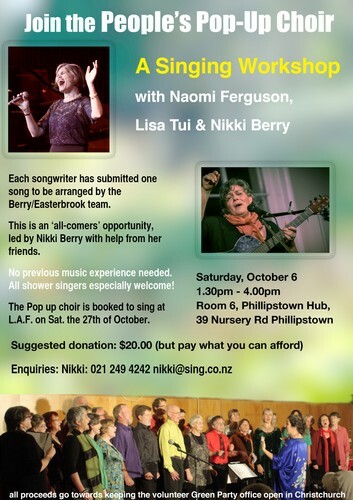 Lisa Tui - SingerSongwriter - is known for her rich and beautiful voice, her songs personal, connecting and clever. With a background in gospel, funk, music theatre, jazz, pop and country, her music reflects a little of all those influences. Nikki Berry leads the Rockers of Ages Choirs, A Capellago and the Open Song choir, as well as running a range of workshops including those for people who think they can't sing. She will be supported by members of the A Capellago choir. Loren Easterbrook is an arranger/composer and music teacher currently living in Melbourne. She brings her significant arranging skills to the project.